You might not be able to see it, but your fish can certainly feel it. I’m talking about water temperature, and as you will soon learn, it’s pretty a pretty big deal. 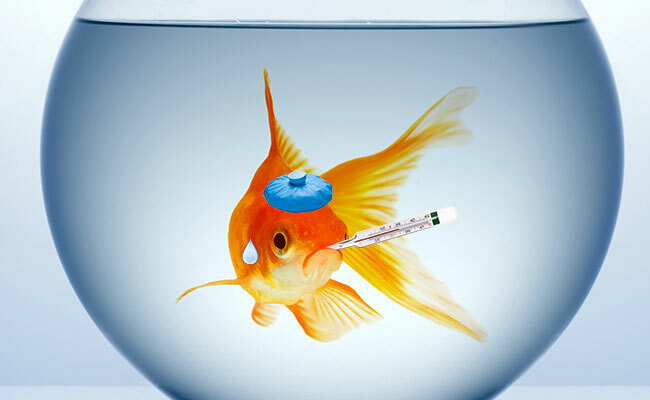 In fact, if you don’t monitor the temperature of your aquarium, then you are putting the lives of your fish at risk! See, I told you it was important. Today, I am going to teach you everything you need to know about water temperature, including why it’s so important and how you can maintain the perfect temperature in your aquarium. What happens if your aquarium temperature is too high? What happens if your aquarium temperature is too low? What is the recommended water temperature in aquariums? 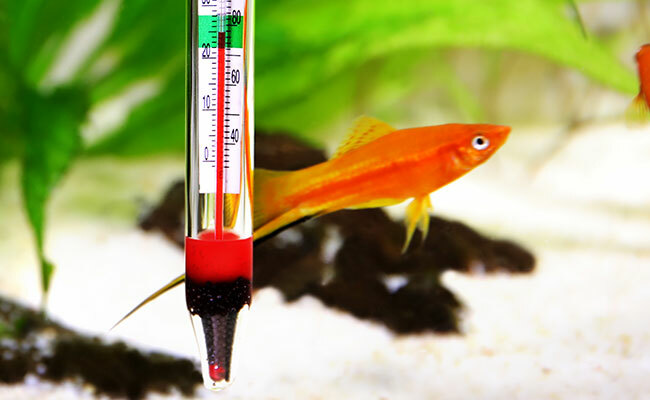 How do you maintain the ideal temperature in your aquarium? All fish have an ideal temperature range where they will thrive. Yes, I said range – in most cases, your fish do not need an exact temperature. This makes sense, I mean, in the wild, there is no aquarium heater ensuring that the water temperature remains constant. Rain, hot summer days and cold winter nights all work together to ensure that fish in their natural environment do not experience the same temperature for too long. In fact, freshwater fish can experience daily temperature swings of 30°F or more. Even in the reef environment, the daily temperature swings from 68-90°F (20-32°C). So if this is the case, then why do we insist on keeping our aquariums at a constant and stable temperature? Well, it all comes down to how fast the temperature swings. Because oceans and rivers contain so much water, it takes a long time for the temperature to rise or drop. The change in temperature can take a day or even a season to complete. Your aquarium, on the other hand, is not so lucky. The small amount of water can quickly heat up or cool down based on the temperature outside the tank. It is this rapid change in temperature that is the problem. So in your home aquarium, the goal is to maintain a water temperature that is within the preferred range of your fish, invertebrates, plants or corals. What do you do if you feel cold? You probably put on a sweater or turn up the thermostat. I know I would. On the flip side, what would you do if you feel too warm? Turn on the air conditioning or grab a refreshing drink, right? Unfortunately, these are not options for your little fish. You see, your fish are cold-blooded. And, it might surprise you to learn that this does not mean that their blood is cold. Instead, it means that your fish cannot regulate their internal body temperature – as the water temperature changes, so does their body temperature. Water that is too warm or too cool becomes uncomfortable. In the wild, a cold fish would simply swim to warmer water. Similarly, a warm fish would hunt out a nice cold spot. But the fish in your aquarium? They don’t have this luxury and are forced to endure the temperature of your aquarium… There is no escape, even if they wanted to! 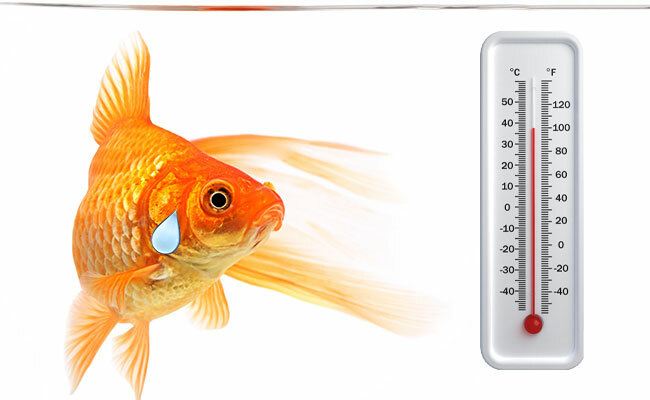 Unfortunately, this temperature can have a negative impact on the health of your fish. In particular, the water temperature has a direct effect on your fish’s metabolism. If the water in your tank is too cold, then your fish’s metabolism will slow down, which leads to your fish becoming sluggish and sleepy. On the flipside, water that is too warm causes your fish’s metabolism to speed up. Your fish will become more lively or even hyperactive. You see, the stress caused by fluctuating temperature weakens your fish’s immune system. Even fish that are briefly exposed to temperature swings are less resistant to disease and parasites like Ich – which feed on the fins, skin and gills of your fish. Normally, your fish’s immune system would easily fight these off – they are no match for healthy fish. But when temperature-stressed, your fish are an easy target for these diseases and parasites, which can soon kill them. The life of your fish depends on your ability to maintain the correct temperature. Don’t have fish? You’ll still need to keep an eye on the temperature. Invertebrates, corals, plants and algae have all been observed to be negatively influenced by temperatures outside of their preferred range. Even the beneficial bacteria in your aquarium are affected by water temperature. The preferred range is 65-85°F (18-29°C). At 95°F (35°C), bacteria die, which can lead to ammonia spikes. Lower temperatures cause the bacteria to become less active and can even make your aquarium take longer to cycle. Warm water causes the biggest issues, typically once temperatures exceed 90°F (32°C). Your fish breathe by drawing oxygen out of the water. And under normal conditions, your aquarium will have more than enough oxygen to go around. Warm water causes your fish to become more active and require more oxygen. Just one problem – warm water actually holds less oxygen than cooler water. In severe cases, there won’t be enough oxygen to go around, and your fish can suffocate. To add to the disaster, the beneficial bacteria in your aquarium need oxygen to break down ammonia. Without enough oxygen to go around, the ammonia in your tank begins to build up, displacing oxygen and burning the gills of your fish. As you see, warm water can kick-start a number of deadly problems in your aquarium. For tropical fish, low temperatures can also cause a problem. At lower temperatures, these fish can become slow and sluggish, and many will soon die. It’s similar to how you can survive outside without clothes or bedding. However, the experience would be uncomfortable, and you would soon catch a cold or the flu. Here’s where things get a bit tricky. Each fish has its own preferred temperature range and tolerance to temperature swings. Temperate fish: A wider range of temperatures, often overlapping the above categories. The temperate fish category is a recent creation to cover fish that don’t fall into the cold-water or tropical categories, like goldfish. Even so, temperate fish still have a preferred temperature range where they will thrive. Typically, fish that come from large bodies of water, such as oceans or large lakes, are generally less tolerant of temperature swings. This is because these large ecosystems have stable temperatures, so the fish have not adapted to fluctuations in temperature. It’s up to you to research any fish that you plan on adding to your aquarium to figure out its preferred temperature range. Usually, the place you are buying your fish will provide that information – all you need to do is ask. Oh, and it goes without saying that the temperature of your tank will determine the fish that you put inside it. Just because two fish can live at the same temperature, doesn’t mean they should be added to the same tank. 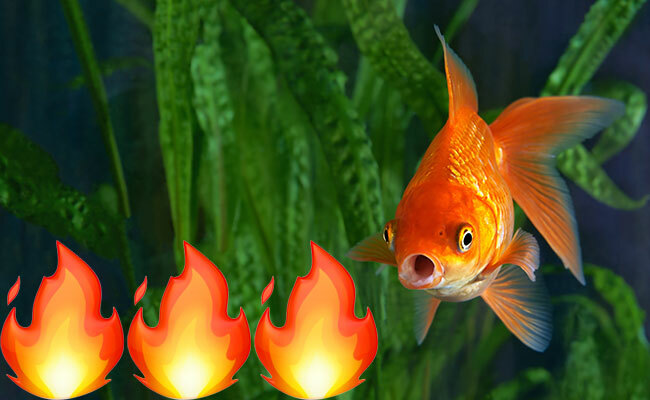 Both fish can survive at 72°F (22°C). As long as you keep the temperature at precisely that, the fish can live together, right? Unfortunately, this isn’t the case. In this instance, both fish would be living at the edge of the temperature range that they find most comfortable, which can lead to both fish becoming stressed and having shorter lives. In the wild, fish don’t experience the edges of their temperature range for long. Keeping your tank on the edges of this temperature is like creating a permanent summer or permanent winter for your fish. It goes without saying that some fish are more tolerant to temperature changes than others. And those of you with experience will have a better understanding of exactly what temperatures your fish can tolerate. But for any beginner starting out, stick to the middle of the temperature range – it leaves less room for error. Remember: Just because your fish is surviving, doesn’t mean it is thriving… Fish have recommended temperature ranges for a reason. Just because your fish is alive at a temperature outside of this range doesn’t mean it is happy or healthy. Now that you know why the correct temperature is so important, it’s time to maintain it. If you know what the temperature is inside your aquarium, then half the battle is won. Unfortunately, warm water looks the same as cold water. That’s why you need an accurate aquarium thermometer. It really takes the guesswork out of monitoring your aquarium and is an essential purchase for every aquarium! With your thermometer in hand, it’s time to take a closer look at how you can maintain the perfect temperature for your fish. It all starts with where your fish tank is located. 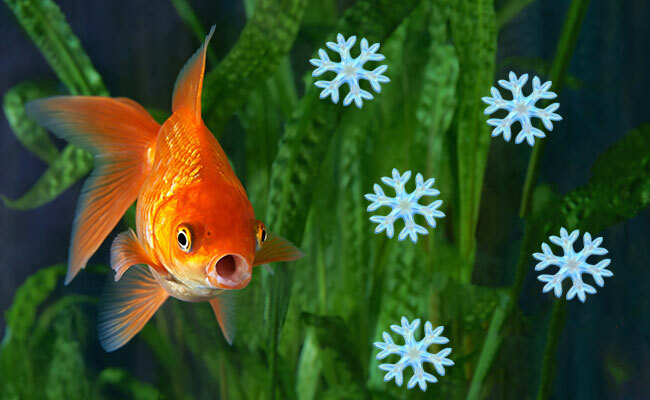 Drafts from open windows or AC vents quickly cause the temperature in your aquarium to plummet. Similarly, the midday sun that is shining through your windows, hitting your aquarium, can cause the water temperature to soar. This is why it’s so important to choose the correct location for your fish tank when setting it up! Aquarium too cold? It’s time to turn up the heat! Heating your tank is darn simple. All you need is a good aquarium heater. This handy little device sits underwater and will continue to warm your water until your desired temperature is reached. If you live in a warmer area (looking at you, Arizona!) then you might have the opposite problem. The hot weather makes your aquarium water too warm. Leaving your AC cranked is overkill, not to mention expensive! The cheapest solution is to use a fan. While any old fan will do, there are fan systems specifically designed to keep your aquarium at the correct temperature. Those of you with larger tanks might find that a fan isn’t enough to lower the temperature. In this case, you have the option of using an aquarium chiller – essentially a canister filter that cools the water as it flows through. Wouldn’t it be great if you could set up your heating and cooling equipment to remain switched off and only turn on when needed? An aquarium heater controller is the exact product you are looking for! Simply plug in your heater and fan, set the desired temperature and walk away. If the water temperature drops below this setting, the heater will automatically turn on to warm your water back up. Similarly, if the water temperature gets too hot, the controller will turn your heater off and turn your fan on, to cool the water back down. All without any effort on your part. Pretty cool, huh? A stable water temperature, within a few degrees of the recommended range, is important for keeping everything in your aquarium happy and healthy. With the help of heaters and chillers, keeping your aquarium at the proper temperature has never been easier! Do you have any temperature tips? Let me know in the comments below! Hidden From View - In-line Aquarium Heaters Are the BEST! Wow! That is some dedication! I have a small 300-liter fridge and might be away for these summers with someone feeding them twice and cleaning the aquarium fortnightly. However, my house gets HOT. Hot to 45*C+. And, I do not have airconditioning. If I leave the fish alone in this house, they shall be roasted! MUST FIND A NEW HOME!n PRONTO! So basically yeah, this well written article says: Keep it not too cold and not too hot. I have a 1000-gallon tank that I am using a moving bed filter to treat the water. I have the tank and filter as air tight as I can get them but with the moving bed filter adding a lot of forced air in to the filter & tank I am worried about the humidity that could possibly be getting out in to my room. I heat the water to 75 degrees and my room is any ware from 62 to 70 degrees. I am thinking about installing an air vent from the tank and filter to the outside. Right now, I have no problems, but It is winter and air inside the house is dry from my home heater running a lot. What are your thoughts, and do you have any suggestions? Unfortunately, the answer here is: “it depends” I’d personally take the wait and see approach, before spending time and effort installing an airvent with a fan if it’s not needed. I’d suggest buying a humidity monitor, they can be picked up for cheap and monitoring the situation, reacting accordingly. I am considering turning my in ground pool (40x 17)into a pond. My Wife and I still want to swim in it but we like the water to be at 85 degrees. What LARGE tropical fish can thrive at 85. We will run the heater year round. We live in Los Angeles. 85˚F is on the extreme of what most fish would experience. I wouldn’t recommend it as a swimming pool, it’s the perfect temperature for bacteria to flourish. Ordinarily chlorine and other chemicals would keep this safe for humans, like in the case of a hot tub, but if you were to add this, you would kill your fish. I have a 150 gallon high glass tank. Is it better to get 1 heater or 2? Great question! For larger tanks like yours, I prefer two as a safety precaution. If one blows, the other will stop the temperature falling as quick. Similarly, if one gets stuck “on” it won’t cook your fish because it’s not powerful enough. I recently purchased a water changing system. I live in Florida, since it is currently winter it is easy to warm up cold tap water to temp. In the summer, the tap water can be in the mid to upper 80s (f). What is the temperature differential tolerance for adding warmer water to a tropical community tank? Will 60 gallons have enough have existing water (25% water change) to be stable? What about 10 gallons? A 29 gallon goldfish tank? that’s more a maths related question than one I could tell you off the top of my head. I have never had to deal with that situation, so cannot even give you a ballpark figure from personal experience. When I’ve been in Florida, the cold water has never reached that high. Even on a hot day. Is your situation different? The only thing I could suggest is use an accurate thermometer and slowly replace the water, monitoring it closely. Eventually you’ll get a feel for the tolerance. I would love some advice. We have 9 small koi (approx. 4 cm each) in a 60 litre tank. We were advised to keep our water at 26 degrees (as per all other tropical fish). The more I read, the more I realise the water should be a lot cooler, even simply room temperature. How to I transition to a room temperature tank – do I lower the water heater by 1 degree each day or so? Whether raising or lowering the temp, slow is best. Your transition of 1 degree per day would be fine. If you wanted to, you could do it quicker, say 1 degree every 3 hours or so. 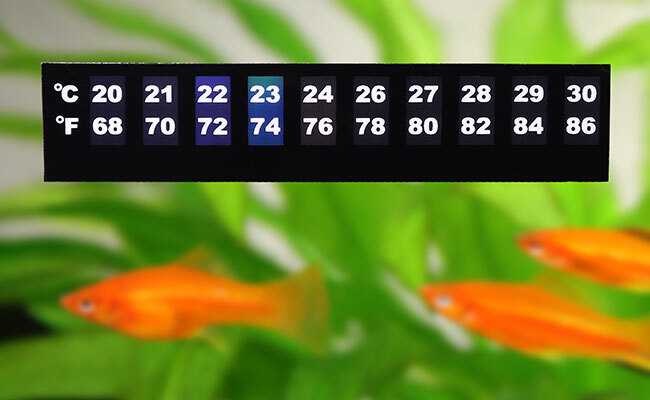 I’d be more concerned with how many koi you actually have in your tank than the temperature. nine 1.5 inch fish in a 15 gallon tank is dangerously overstocked. It’s generally recommended you only stock 1 inch of koi per 10 gallons of water while they are growing – so if a single koi is 5 inches long, you would need a 50 gallon tank for that one fish. There is a reason why Koi are generally kept in ponds. However, this is outside the scope of this article, so I suggest doing some more research here. Good luck! Ian, thank you for your accurate advice. You are absolutely 100% correct about the koi being overstocked. It boils down to research before hand, which we did not do. Also, it is amazing how many pet shops will sell you fish without the correct advice. I have since managed to re-home the koi. That’s fantastic to hear you were able to re-home your Koi. Don’t blame yourself on research, in the current year you would expect to walk into a petstore and receive accurate advice on how to care for the pet you are purchasing – I don’t think that’s unreasonable. Advice that is common knowledge among fishkeepers isn’t repeated at the storefront. Bigbox pet chains are the worst at this. It’s a big reason why the “you can add fish to your tank on day one” myth won’t go away. Independent fish stores are generally much better. If you are going to give this hobby a second chance, I recommend using your local one, the owners are typically much more knowledgeable as they raise their own fish too. Wishing you all the best for the future! Mr. Ian… I have a 20 gallons aquarium. I have 3 gold fish. My water tank gets so cold in winter time… should I buy a heater to warm the water.. and If i buy it.. what temperature should it be? I’d be more concerned with the size of the aquarium than the temperature. If your temperature is rapidly fluctuating then a heater is advisable. I’m glad to hear everyone in your tank is getting along. I’m not sure where you heard “cold water is refreshing” but I can assure you fish don’t find sudden temperature drops refreshing. More like stressful. Normally you would try to match the temperature of your tank when performing a water change. As for temperature, read up on the preferred temperatures of your inhabitants and pick a happy middle ground. If that’s 75 or 78, it doesn’t matter as long as it’s constant. Okay, thank you. I’m a bit confused, though. If it stresses them out when the water drops a few degrees when I do a water change, won’t it stress them out too if I higher the temperature to 78 degrees in the tank? The heater won’t instantly change the water temperature. It needs time to heat the water around it. The change can take a few hours. This is normal, like what happens in their natural habitat across a day as the sun hits the water and sets at night. When you do your water change, the temperature change is instant. It’s this rapid change that stresses fish. While changing water in aquarium unfortunately cold water was given erroneously more som some fishes were go dying. Though I immediately added hot water to maintain 28 degree as required. Fishes look survived. Any thing more to do? Good save. Depending on the water source, your hot water heater may have trace amounts of copper – this comes the heating element. It’s likely such a small amount that you won’t need to worry about it unless you have particularly sensitive fish, plants or corals. Generally speaking, between 82˚F and 86˚F, although their are some discus that prefer it a little warmer. You’ll have to research the specific discus in your tank. just remember – it’s more important to keep temperature constant than exact. Very helpful reviews! I had two aquaria with lots of fishes in it. But they die frequently. I couldn’t find the reason behind it. Later on, I have found that my fishes die due to hot temperature in water. your article helped me a lot to find the solution for my aquaria. Thank you for sharing your reviews.